I'm quickly checking in so y'all know I made it back in one piece from Amsterdam and my whirlwind thrifting trip was a ... SUCCESS! As my coach crept back into London town at 7am on Sunday morning I felt like I was doing a massive morning after ‘walk of shame’ in the same clothes as the night before and without sleeping for around 36 hours. I was a little edgy to say the least. I caught the bus back from Victoria coach station and I was showered and in bed and woken up with French toast and coffee and back to my normal self by midday! I only had a vague memory of all the things I had found and opening my case I felt a little nervous but wow what a bounty to behold! I’ve been sharing some sneak peeks over on Instagram and long time fans will know if you see anything you like this is usually the very first place you can snap something up, even before the items make it into the online shop. 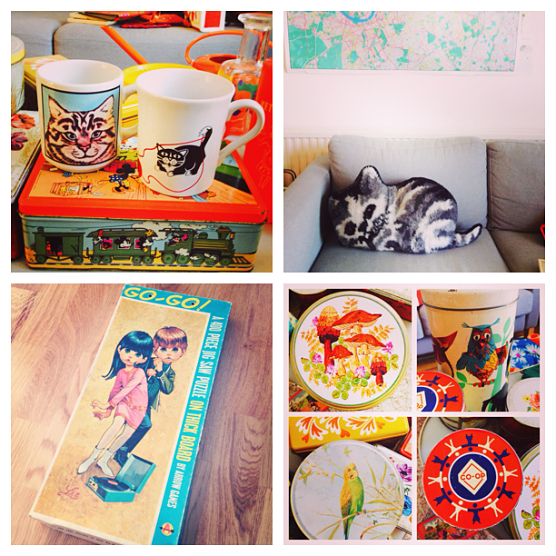 So if you’re an Instagrammer then look me up here: Thrift-ola and you’ll be the first to see my fave finds. In the meantime, I’m going to be finalising the re-launch date for my online shop this week so stay tuned.